Begin your tour with an early morning pick-up from your Alanya hotel and soak up the scenery as you drive along the Mediterranean coast. The first stop of the day is the Roman theater of Aspendos, where you’ll have plenty of time to explore the mighty theater, take photos, and climb to the top for view over the surrounding countryside. Accompanied by your guide, hear how the theater dates back to 155 AD and is still in use today, hosting concerts throughout the summer months. After a short drive from Aspendos, jump out to stretch your legs in the Kursunlu National Park, and enjoy the views of the Kursunlu Waterfall, which cascades down into a pool of gleaming turquoise waters. Alternatively, you can opt to visit the majestic Manavgat Waterfall instead. Stop for lunch (included) at a local restaurant along the riverside, then continue to the coastal town of Side. 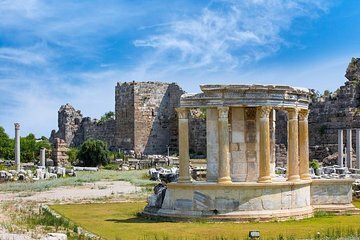 As you pass through the ancient city gate, hear how the ancient Greek-Roman city was founded back in 7th century BC, and captured by Alexander the Great in 333 BC. Today, the magnificent ruins lie scattered through the modern resort town, so you can marvel at highlights such as the agora, the theater, and the Roman Baths; pose for photos by the spectacularly situated Apollo and Athena temples, high on the coastal cliffs; then stroll the historic streets, now lined with souvenir shops and cafés. After a day uncovering Turkey’s ancient past, journey back to Alanya, where your tour ends with a drop-off at your hotel. It's booked with a Polish company, with a Polish guide. They did bring an english talking guide for my friend and I, but it was hard to understand him most of the time, and we could hear that the Polish people got so much more info. But the trip was good, very beautiful and the lunch was alright too. You get to see a lot for the money.